The news article that reported this exchange suggests that he was throwing jabs at American voters who didn’t actually go to the polls and vote in the 2016 Presidential election. Even if that’s the case, his words are true in general. Politics is about representation. Our politicians are elected political representatives whom the voters appoint on their behalf to represent them in the political realm. The politicians are supposed to bring the concerns of their electorate to Congress. Their actions and behavior are reflections of the people they represent. The nature of modern politics is this: deciding how the federal budget will be allocated. Which group of citizens gets how much funding for their particular program? That’s because the budget is so huge: about $4 trillion in 2016. That’s a lot of money that needs to be spent, and everybody is eager to get a piece of the action. In general, politicians know where their bread is buttered. They rarely vote in ways that they know will flat out get them ejected from office by the voters in the next election. The politicians seek political power and influence, and the way to capture those treasures is by the only currency that matters in politics: votes. 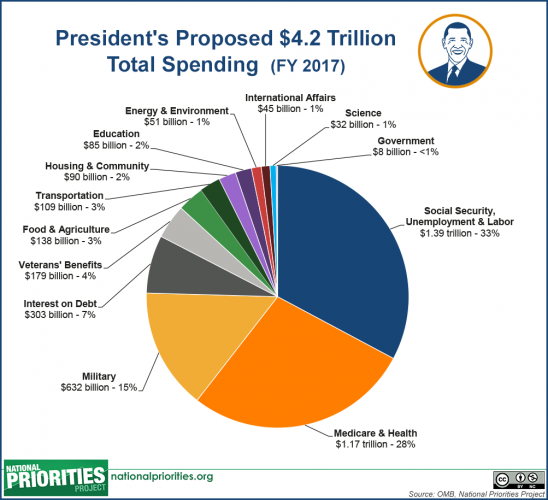 Seventy-six percent of the federal budget is already spoken for by various entitlement spending programs (Social Security, unemployment benefits, Medicare) and the military budgets. In FY 2015, 24% went to Social Security and 25% went to Medicare and Medicaid, about half the total budget. There are no protests about entitlement spending. No politician would run on a campaign to cut Social Security: he would not be elected, or else, if already elected, he would be ejected in the next election. In other words, counting interest on the debt, Americans are united on where almost three-quarters of the money ought to be spent. The electorate appears divided, but in reality they come together to defend those three-quarters of the budget. They are locked in place. The heart of entitlement spending is this: theft by taxation. Tax your neighbors to pay for your [whatever]. Old-age welfare. Public schools. Medical care. Most Americans think there’s nothing immoral about this. They have ignored the eighth commandment: thou shalt not steal. The people were corrupt, so their leaders, their representatives, were corrupt. As a population, they were morally debased. This showed up in their eroding silver coinage and watered-down wine. Today, we don’t even have hard money (gold, silver) to debase. Instead, we have fiat-backed paper currency that continually depreciates through a process of perpetual price inflation. Presidents and politicians cheat on their wives. Why? Because Americans cheat on their spouses in general. Divorce rates are high. People generally don’t think adultery is a serious crime. Americans cheat. Our politicians cheat. Then they cheat on us. Obama is right. We get the politicians we deserve.